Computer repairs, sales and service. At our computer repair shop we service and repair any model of phone, tablet, laptop or desktop computer. Apple Mac and PC, hardware and software faults, we can fix it. Because our Sunshine Coast computer repair shop is fully equipped we can handle all volumes of repairs at one time. Come and see our range of computer devices for gaming, business and home use. Drop into our Mooloolaba computer repair shop anytime and check them out. We have lived and grown on the Sunshine Coast. From humble beginnings as an internet cafe to today as one of the top IT repairers on the Sunshine Coast. At our computer repair shop our number one focus has been our customers. Whether it be a single repair for an in home computer user all the way up to emergency repairs for one of the biggest shopping centres on the coast. Focussing heavily on customer service and high quality spare parts has been what sets us apart from other computer repair shops. 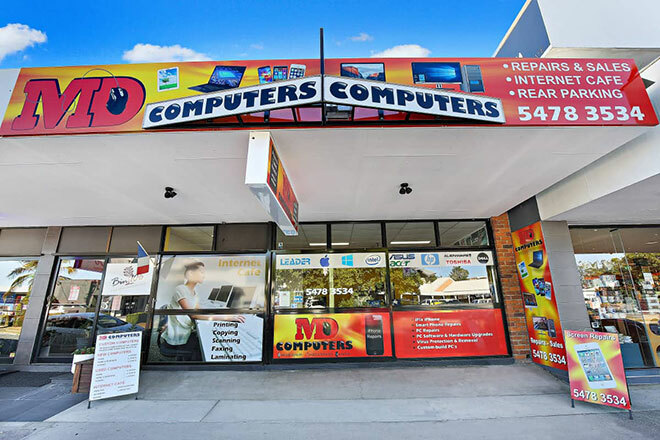 Here at MD Computers Sunshine Coast we take pride in all of our phone, laptop, desktop, tablet repairs and our business and commercial repairs. We constantly want to go beyond our customers expectations in their time of need. Complete the form below and we will getback to you as soon as we can.